A typhoon which struck the northern Philippines and brought floods and power cuts is a sharp warning for tourists to make sure they have travel insurance cover. 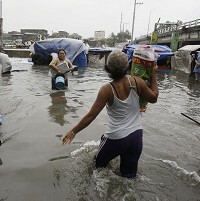 The storm brought work to a halt in the capital Manila, closing government offices, schools and universities, and resulted in water reaching waist-height and trees being blown down. Typhoon Nesat made it necessary for authorities to order more than 100,000 people to take shelter from rain and winds of up to 106mph. A baby is known to have drowned and four fishermen have been reported missing after the storm struck land from the Pacific, covering the mountainous provinces of Isabela and Aurora in the east of the country. The government's weather bureau said the typhoon, with a 400-mile cloud band, struck with sustained winds of 87mph. It threatened foul weather over all over the main Luzon Island as it moved over the Philippines towards the South China Sea and southern China.